ObjectiveEd.com is our new organization where we are building Expanded Core Curriculum interactive simulations for blind students, based on a child’s Individual Educational Plan. The student’s advancement in mastering skills in our ECC-based games and interactive simulations are maintained in a private secure cloud, accessible to the teachers in a web-based dashboard . For the students to appreciate how an app is built, I decided to start from the top-down: layout out the top-navigation menu, then determine what function each menu item should perform, and then create the features of each menu item. 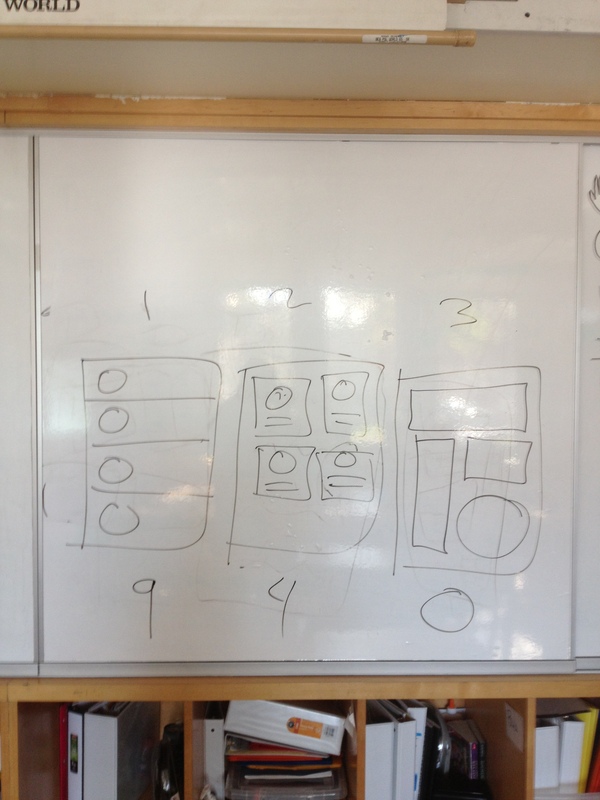 Some choices had obvious downsides, so I asked each student to critique the layouts they didn’t like. The problems with the grid layout (#2) was that once you included a title, only about 4 icons would show. The problem with the tile layout (#3) was that we couldn’t decide which tiles should be big, and which should be small. They liked the horizontal scrolling bar at the bottom, but that’s fairly difficult to implement on an iPhone (and doesn’t follow iPhone standards), so I discouraged it. The final vote was 9 for #1, 4 for #2 and 0 for #3.